There are many different types and styles of rain gauges on the market. Some are much more sophisticated than others and some may be more decorative in style. They all have one thing in common and that is that they can measure rainfall and let you know how much rain you are getting. The best rain gauge is strong, long lasting and durable. Our pick, AcuRite Deluxe Wireless Rain Gauge, is a high quality, accurate rain gauge that is made from weather resistant material. If you are a farmer, own a garden or you just like to record the weather, you may find that you need a rain gauge to determine how much rainfall you are getting on any given day. The main thing you want to look for is a rain gauge that is reliable and accurate. There are several things you will want to consider when looking for a rain gauge for your home. These considerations will include your budget, how much you will be using it, the accuracy level you need, how easy it is to read, whether it’s rain proof and much more. These factors will determine the type and style of rain gauge that will be the best choice for your needs. 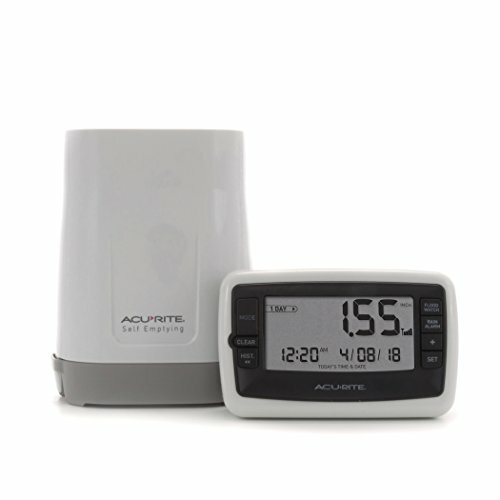 AcuRite Deluxe Wireless rain Gauge provides you with precise and accurate precipitation measurements with durable, weather-resistant construction that will stand up to the elements. You can choose to record rainfall in millimeters or inches, whichever you prefer. There is also a flood watch alarm that will indicate whether the conditions are likely that flooding could occur. Data is transmitted every 16 seconds so you have the most up-to-date information at your fingertips when you need it. The automatic, self-emptying cup eliminates the need to manually empty it. Measurements include rainfall totals for the day, the last 7 days, the current rain event and also include two totals that are re-settable. Features also include an easy to read LCD screen that provides you with the daily rainfall and also records rainfall history. There is also a clock and calendar as well. The rain gauge is mountable on the wall or can be free-standing if desired. It comes with a 1 year limited warranty as well. The Stratus Rain Gauge will monitor rainfall amounts accurately and easily. The heavy-duty polycarbonate is UV resistant and can stand up to years of full sun or tough weather and won’t corrode or fade. There is a funnel at the top that catches the rainfall and feeds it to a tube that is one inch in diameter that will measure the rainfall. Rainfall over 1” and up to 11” will be caught in the extra large cylinder that is on the outer part of the rain gauge. This part can be detached and used to measure sleet, snow or hail as well. Accuracy is guaranteed to 1/100th of an inch so you know you will always have the right recordings. Installation is simple; just attach it to a post or railing away from any buildings or trees using the quick connect bracket which also allows for fast removal for cleaning or measurement reading. You won’t have to worry about metal parts rusting either. If you want a rain gauge that is durable and long lasting, choose the OutdoorHome 6” Deluxe Rain gauge. You won’t have to worry about yellowing or cracks with this tough rain gauge. This rain gauge is resistant to frost and resistant to discoloration from the sun. OutdoorHome provides you with a dependable and sturdy gauge that is accurate, easy to read and reliable too. You will feel like you own a commercial rain gauge without having to spend a fortune to get it. The scale itself has graduations that are raised with numbers that are large enough to see easily so you get a quick, accurate measurement of rainfall. Installation is easy, just attach the mounting plate, that is included with your purchase and mount it on a post or wall, slide the gauge into place and you’re all set. Rainfall measurements can be in millimeters or inches. It is perfect for your garden or yard and is fun for the kids too. It has the capacity to collect as much as 6” of water and is made of polycarbonate plastic that is heavy-duty and UV resistant. Whether it is sprinkling or you have a heavy downpour, this is the rain gauge to handle it. This rain gauge from OutdoorHome comes with a warranty as well. Sometimes people want to know how much rainfall there has been just out of curiosity or because they enjoy weather. Others need to know and the information is an essential part of their day to day life. 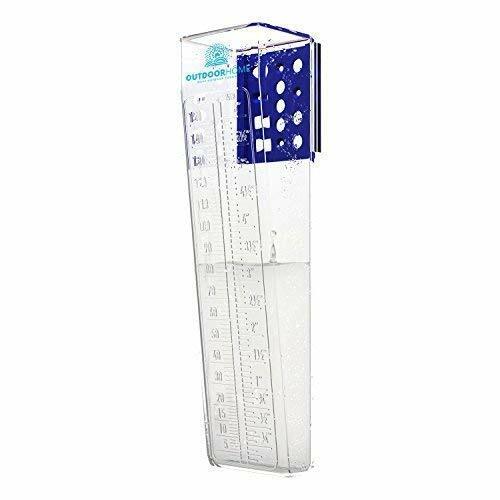 It doesn’t matter what your reason is, if you want to accurately measure the rainfall in your area, you will need to get a reliable and accurate rain gauge. Fortunately, there are plenty of choices to choose from, from the decorative and functional to the much more technical models. Whether you are someone who makes a living based on the rain or you just want to know, you will be able to find the right rain gauge for your needs. We have featured three different rain gauges for you to consider. All three of these models are top rated and provide you with accurate, reliable measurements you can count on. Each rain gauge is easy to read and has plenty of features that make it simple to install and catch rain in. If you want to learn more about rain gauges and what to look for when you are researching the different choices, read the buyer’s guide below. This information will provide you with the education you need to identify the different types and styles or rain gauges available so you can make an informed decision that will work for your needs for years to come. The easiest and most reliable way to measure the amount of rainfall you are getting is to purchase a good quality rain gauge. There are many different types of gauges on the market to choose from. We have listed the different styles below along with some information about each type so you can tell them apart and determine which style meets your needs and preferences the best. Wedge – What usually determines the type of rain gauge it is, is the opening on top. This affects how the rain is caught and measured. A wedge rain gauge will be wider at the top than it is at the bottom. This type of rain gauge requires manual reading. Digital – This type of rain gauge can collect rainfall from outside and uses a sensor that is on the interior that provides accurate readings of the moisture collected. Depending on the model, digital rain gauges can track the rainfall yearly, weekly, daily or monthly. 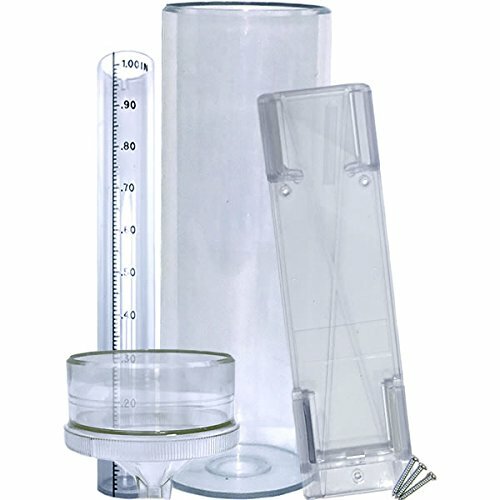 Cylindrical – A cylindrical rain gauge is also read manually, like a wedge rain gauge. The only different is the shape which is cylindrical and measures the same at the top as it does at the bottom. There are several ways that rain gauges measure rainfall. We have listed the different types below so you can decide which measuring style you prefer. Manual style rain gauges – The oldest type of rainfall gauge is a tube that is vertical with a closed bottom and open top. There are graduations on the side that measure in inches and/or millimeters. Over time, rain is collected and the readings will need to be manually read and then emptied. It is best to empty the gauge on a daily basis after recording the day’s rainfall. Some types of manual rain gauges have both an inner and outer tube. The outer tube is an overflow tube and helps keep accurate readings even in a downpour. Manual rain gauges are typically accurate to within 1/100th of an inch and are usually labeled the gold standard of all rain gauges. Weighing Style Rain gauges – This type of rain gauge collects moisture in a container that is placed on top of a scale. The rainfall is weighed every so often and the information is recorded by a logger or by a pen if the model is older. Weighing style rain gauges are very accurate for measuring high intensity precipitation. They can also be used to measure snow, hail and sleet. This type of rain gauge is the most accurate but can also be the most expensive type of rain gauge on the market. Tipping Bucket Style Rain Gauges – The most widely available and commonly purchased type of rain gauge is the tipping bucket style. This type of rain gauge has two small containers that are located next to each other but only one container is exposed to the funnel of the gauge at a time. When a container fills up to a specific volume the bucket tips and dumps out the water, exposing the other container so it can be filled. The measurements are recorded by the number of tips that the containers have. Bucket volume is calibrated and each tip of the container matches a small, fixed amount of rainfall. It will usually be .1mm or .01 inch. This type of rain gauge is a lot less accurate than other types due to the possibility of the container not emptying fully when it tips. Acoustic Style Rain Gauges – Acoustic rain gauges work by counting the number of drops that fall onto a plate that is above a special sensor. Each drop generates an acoustic signal that will vary according to the size of the raindrop. The cumulative total of the signals over a specific period of time is the same as the amount of rain that hit the sensors. This type of rain gauge can easily distinguish between hail and rain due to the difference in the acoustic signature. Acoustic rain gauges are maintenance free, and have no moving parts. They are not as accurate when the rainfall is heavy. They are not used as often as tipping buckets are. There are several factors that you will want to consider when you are looking for the right rain gauge for your needs. These considerations will determine how long the rain gauge lasts, how easy it is to use, how accurate it is and other factors. There are other purchase considerations you will want to think about as well. We have listed all of these considerations below. Outdoor Durability – A lot of the rain gauges on the market are made from inexpensive plastic that doesn’t do well in extremely cold climates. If your rain gauge will be outdoors all the time in all kinds of temperatures, you will want to opt for a rain gauge that is made from heavy-duty materials that can withstand the weather and climate. Capacity – the majority of rain gauges can measure several inches of rain at once. If your area is prone to heavy rains this is very important to ensure accurate measurements. Make sure that the capacity your rain gauge has matches your areas usual rainfall. It is better to have too much room than not enough. Visibility – There are many different sizes of rain gauges to choose from. If your rain gauge is set up and installed somewhere where you will be reading it from inside, make sure it is large enough for you to see the graduations on the outside clearly from indoors. Mounting Hardware – Some rain gauges are free-standing but the majority is designed to be mounted on a post, wall or some other structure. Some are on long stakes that get driven into the ground. Decide where you want to mount the rain gauge and determine whether you want a free-standing model on a pole or one that gets mounted on the wall or post. Decorative Style – Many rain gauges are very decorative in nature and can have leaves, frogs and many other designs. These can add a lot of beauty to your yard or garden and are still functional too. Replacement Parts – Sometimes even the heartiest of rain gauges can break. Make sure you choose a rain gauge that is easy to replace or find replacement pieces for should something break. You can also look for rain gauges that have warranties that will protect against manufacturer’s defects. Weather watching is a passion for many people and for others it is a matter of their livelihood. It doesn’t matter why you want or need to track rainfall, what matters is that you choose a reliable, accurate and durable rain gauge that will give you the right readings easily and with minimal hassle. There are many different options for you to choose which makes finding that perfect rain gauge a real challenge if you don’t know what to look for. The information in this guide is designed to help you understand the differences in shape, measuring style and looks so you can pick the perfect rainfall gauge for your needs. Be sure to think about things like how long you want it to last and whether you want an old school style rain gauge or a more high tech design with bells and whistles. You also want to think about your location. Heavy rain areas will do better with a heavy duty rain gauge with a large capacity to handle all the moisture. If your climate is mostly dry, you can get away with a smaller and less expensive style of rain gauge. Also consider if you are in a marine environment. An inexpensive rain gauge used near the ocean can incur a lot of salt corrosion. If you are in harsh climates, consider a high quality tipping bucket design or acoustic style for the most accurate readings. Now that you know the different types and styles, you will be able to choose a rain gauge accurately based on need, region, weather and other factors.